A fast-growing shade tree, walnut can be found in landscapes all over Georgia. 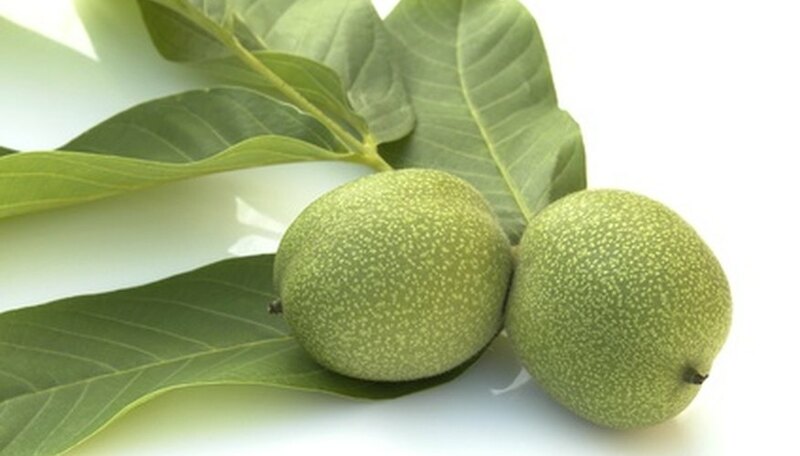 There are many kinds of walnuts which grow in the state, but the English walnut tree (Juglans regia) may be the best of all. Growing 60 feet tall like its cousin, the native black walnut, it consistently produces the walnuts sold commercially. English walnut is perfectly suited to growing in all parts of Georgia. Even when not grown for its nuts, the English walnut tree makes a stately elm-like specimen in the landscape. Select a sunny, well-drained site at least 25 feet away from any structures, sidewalks, driveways and other large trees. Choose a tree which has fresh leaves and a healthy root system. If you are buying a dormant tree, look for firm, pliant branches. You should be able to press a fingernail into the bark of thin branches. A tree with brittle branches is dead. Dig a hole as deep as the rootball and 1 1/2 times as wide. Amend the excavated soil with 1/3 compost. This will help improve drainage and retain moisture. English walnuts like rich, well-drained soil. Remove the tree from its container and place in the center of the planting hole. If the tree is balled and burlapped, cut the twine away from the base of the trunk to prevent girdling as the tree grows. Backfill the hole with the amended soil until it reaches the top of the rootball. Water the tree until the planting hole is full. Let it soak in and add more soil if necessary. Water again, mixing in a liquid plant starter according to label instructions. The vitamins in the plant starter promote strong root growth. Cover the planting area with two inches of mulch. Water the tree during the first two growing seasons once a week, but only when there is no rainfall. To promote deep root growth, water deeply. Replenish the mulch as it disintegrates with fresh mulch to protect the roots from the hot sun and to add organic material, which enriches the soil. You can plant an English walnut tree in spring or fall. In coastal Georgia, plant in early fall, about Labor Day, to ensure the tree has an established root system before it faces its first summer. It will take three to seven years for your walnut to bear fruit, depending on the size of the tree at planting. Plant the largest tree you can afford if this is important. While English walnut trees do not produce the competition-killing toxins black walnuts do, they still have shallow, competitive roots. Give them the space they need to grow, about 50 feet, and don't plan on planting anything beneath them.